This item has now been sold. If you would like to enquire about future availability of this model, please contact us via the form below. ON DISPLAY AND AVAILABLE TO VIEW - LAST ONE AVAILABLE! 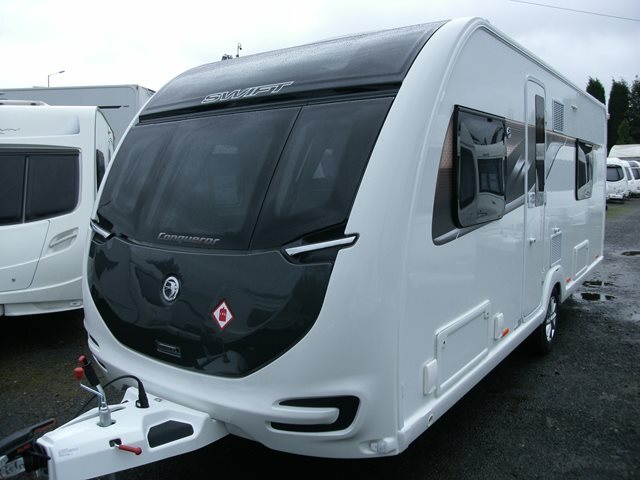 All new Swift caravans now come with a free Powrtouch mover, Limited Time offer!! The four berth Conqueror 565 features two bench seats to the front, central kitchen, twin fixed beds and spacious end wash-room. The Conqueror also comes with alarm, external 230V and BBQ points, heavy duty corner steadies, Status 570 aerial, AL-KO ATC stability control and Alde wet heating. For any further information please contact us on 01384 413336 and ask for a member of the sales team. BE QUICK THIS IS THE LAST ONE AVAILABLE! Already have a caravan? What do you have? We always give our BEST price for any part exchange, contact us to find out what DEAL we can offer you.